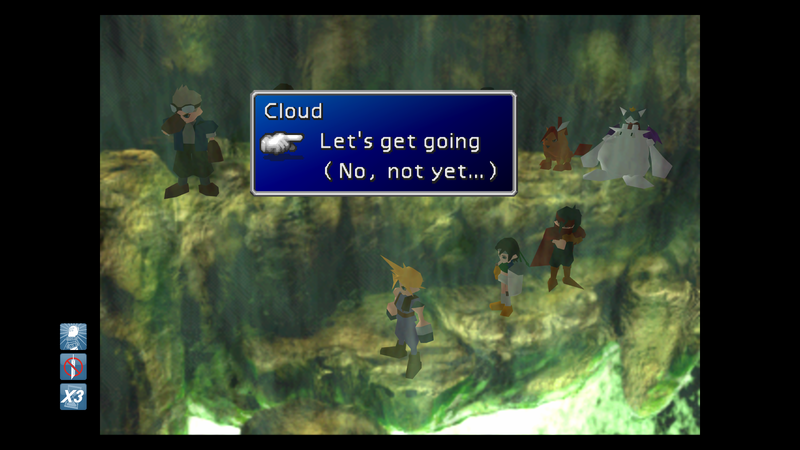 A walkthrough is currently in development for Final Fantasy VII. Howdy, I'll be writing the walkthrough for this game. Some have expressed concern about this walkthrough since I've not yet played through the game before, but rest assured that the walkthrough will turn out completely fine. Besides, if I do need major help, it seems a lot of you have a lot of experience with the game. I consider my position to be good for new players, as I will not gloss over information that someone who knows the game may expect the reader to just know for some reason. As for the walkthrough itself, I do not intend to make people depend on the cheats so easily given to us. I don't want to breeze through the game and as such will not be using them myself. I am aware of the game's missable achievements and have noted them down for myself for later implementation, so thank you to whoever it was in the achievement reveal thread who brought this up. I will be working on this at a somewhat slow pace until I get out of uni for the year (partially due to other responsibilities as well) and I expect the WT to be done sometime during the summer. I would appreciate any and all concerns, questions, or advice you feel like giving, which you can do in this thread instead of messaging me directly. I plan on giving progress reports every once in a while. Anyone following this thread mind giving me a list of things I should be looking out for when writing the walkthrough, like ribbons and materia locations? I'm not asking for the locations, but things like the ribbons/materia that I should be including in the walkthrough. Also, is the game playable after you beat the story? Is there a point of no return? How long is the game if you're not using the 3x speed? Thanks in advance to anyone who responds. Did this over the past few days. You can't save after defeating last boss, it sends you back to last save. I think the point of no return is entering the green glowing crater deep in the last area, but i'm not sure. I think it would be good to streamline, and bypass unneeded side quests etc. Just my own opinion. Feel free to ask me some questions if you want. Thanks for the heads up on the point of no return, both of you. I didn't think of streamlining the walkthrough, as I don't usually tend to do that, but I'm going to consider it if there's a ton of stuff in this game. From what I've played so far, is there a point where you get to free roam? I've only seen up to the second reactor thing and am assuming that whatever content was on Disc 1 in the past is more story-railroad-y. A first free roam part is as soon as you get the Highwind on Disc 2. But after some serious story stuff happens at the north crater on Disc 3 makes the game 100% free roam. With the Buggy, the Tiny Bronco and the Submarine there are only some parts of the game accessible.